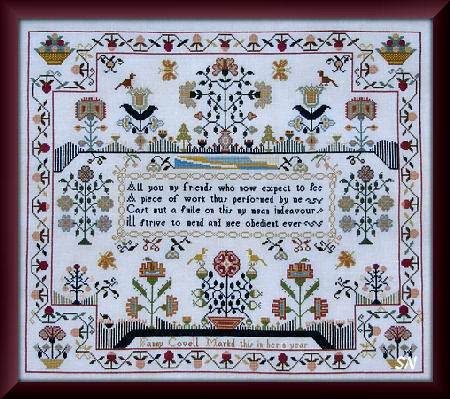 Queenstown Samplers has released several stunning samplers this Spring... Barbara writes about this one... "Fanny Covell worked her exquisite sampler in her 8th year. Everything about it is appealing. 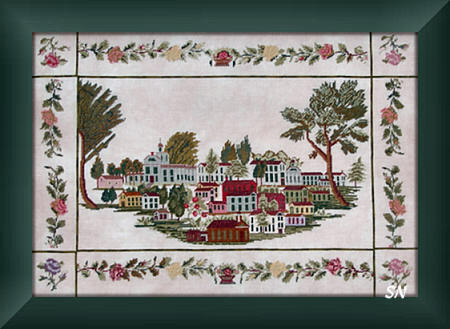 It has gorgeous colors (charted for 24 DMC or Needlepoint Inc Silks) dazzling gardens, birds and butterflies. It in enclosed by a strawberry vine border with scooped corners that have nestling potted flowers and fruit baskets. In the 18th century a definition for 'mean' was humble. Fanny's little misspellings simple endear her further to me. In the center cartouche Fanny wrought All you my friends who now expect to see a piece of work thus performed by me, Cast but a smile on this my mean endeavour ill strive to mend and Bee obedient ever." With a stitch count of 267 x 318, it finishes approx 13 x 16 on 40ct. I love the colors, the delicate, lacy look of this - those flower urns are stunning, and I especially am drawn to the stripes! Offered as a chart. 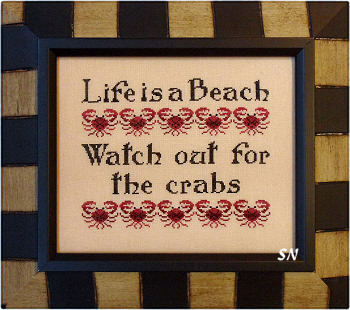 Watch out for the Crabs! This is an oldie-but-goodie design that we used to carry, and then it kind of faded away. Re-discovered, I think it's great! Offered as a chart, I am sure some of you have the perfect spot to hang it... it just makes me smile!!! 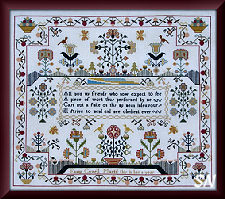 Charted for silk or DMC, on 36ct it finishes approx 6 x 8. Choose any fabric you like, and think about some black beads for the eyes! This gorgeous piece was stitched by 15yr old Mercedes Ospina of the Ospina Coffee company. Her piece is gorgeous -- a lot of French influence because of the Carmelite Convent she attended. There is an entire page of history and family lineage included with the chart -- it is fascinating. 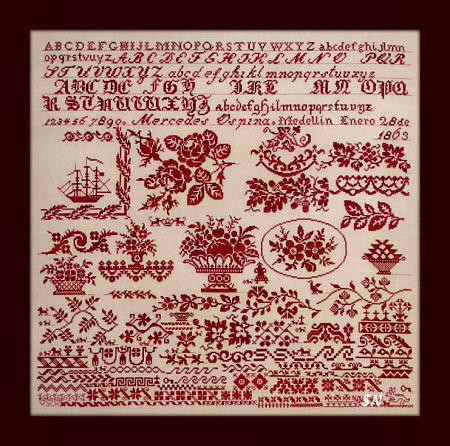 The sampler itself is worked in only one color of red. Stitch count is 306 x 314, so it finishes approx 19 inches square on 32ct. Stitches include Back, Cross, Double Running, Eyelet, Satin and Lazy Daisy. Did you know that there are 19 little stitched dogs on here? So many pretty borders and florals, even the alphabets are flowing and pretty! Offered as a chart. Originally worked on perforated paper, this adaptation is gorgeous! Barbara writes: *Townscape is a bird's eye view of a mid-19th century town, Panoramic drawings and maps of towns were becoming popular in the early 19th century. By the 1840s numerous maps and drawings were available. 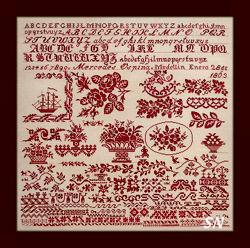 This counted threadwork was most likely adapted from that type of drawing. Splendid detailed buildings are handsomely embroidered. A couple buildings have columns which leads me to think they depict a coart or church. Colorful houses prosper around town. ... Townscape is wrapped in a border of Berlin Work rose sprays and two flower baskets. Charted for DMC floss, this finishes approx 17 x 25 on 32ct. Offered as the chart.